As viewers, it seems only natural to hope that two fellow athletes reigning from the same nation would be best friends — or, in the case of U.S. swimmers Michael Phelps and Ryan Lochte, at least have some sort of bromance. Jamaica's Usain Bolt and Yohan Blake are among the fiercest competitors on the track, but that certainly doesn't mean they aren't pals. In fact, the two have trained together for years. According to Newsweek, Blake and Bolt have always been supportive of each other in a way that motivates the other to push harder. In other words, the competition between them is friendly, but also incredibly real. In the Jamaican team trial prior to the 2012 Olympics in London, Blake had finished ahead of the now "fastest man in the world" in both the 100-meter and 200-meter sprints. Incidentally, Bolt went on to beat Blake and score the gold in both of those races four years later in Rio. The star runner might be faster than his teammate, but only by a small margin. 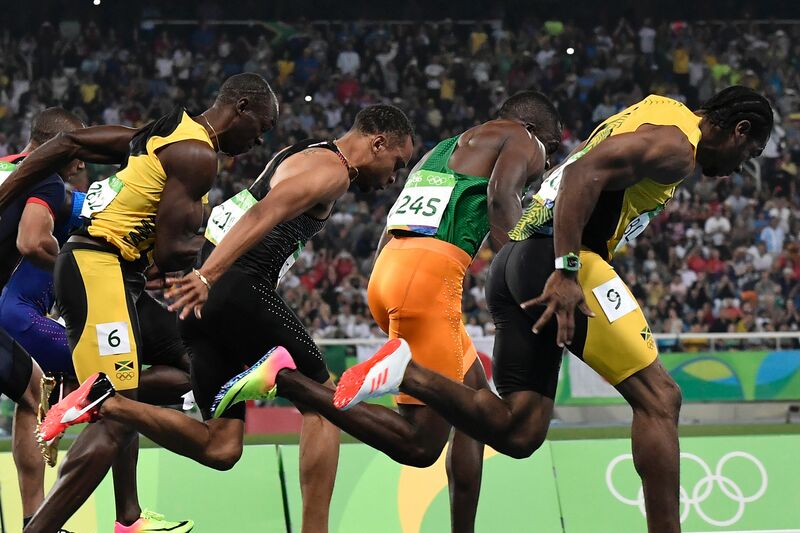 In the 2012 men's 100-meter finals, for example, Blake crossed the finish line second to only Bolt, lagging just 0.12 seconds behind. I doubt anyone can even snap their fingers that swiftly. And though Blake didn't place in this year's 100-meter or 200-meter finals, he still has a promising career. A number of injuries between London and Rio could have contributed to the setback. In 2013, for example, he tore a hamstring. The injury became increasingly serious after he had to go through surgery to reattach it to his pelvic bone, the Daily Mail reported. But if Bolt does indeed retire after the Rio Olympics, like he's suggested he will, Blake is well-equipped to fill his shoes. In February 2015, Bolt told reporters that he would retire after 2017, well before the Tokyo Games begin in 2020. Like Bolt, Blake has a spirit of showmanship that can't be dampened. During the 2012 games, for example, he ran with a nickname that's stuck: the Beast. To really convey the title, he even cut through his track shorts to create the illusion that he had clawed them. And the story behind that name happens to speak volumes about his and Bolt's relationship. None other than the fastest man in the world himself gave Blake the name. "Watch out for Yohan Blake. He works like a beast. He's there with me step-for-step in training," Bolt said during an interview with a Jamaican TV station. And if Bolt retires in the near future, there's reason to believe Blake, in turn, might have a little more room to rise up in the ranks.